She declared her disdain for the practice of selecting white models over black models for various magazine covers. It’s almost as if the double standard for black models still exists in this day and age and Naomi believes that black beauty has been sidelined in the fashion industry. 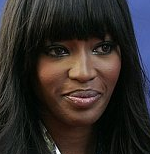 Supermodel Naomi Campbell has vowed to set up her own modelling agency in her beloved Kenya in an attempt to redress the balance between black and white fashion models. Campbell, notorious for her temper tantrums and who has earned a lucrative living as one of the world’s most famous black models, was speaking at a press conference in the beach resort of Malindi, Kenya, where she is on holiday. The 37-year-old said she found it harder to get onto the coveted front cover as editors of magazines like Vogue consistently chose less prominent white models for news stand impact. She is very right about one thing: this business is about selling. If your face can’t sell the magazine or product, the chances of you getting hired by a publisher are slim to none. The best thing you can do about it is press forward and make sure that put your best face forward. Though we’re not entirely Naomi fans around here (she’s pretty, but her attitude can use an overhaul), we are proud of what she’s doing. Diversity is a good thing — air-brushing black women to make them look lighter on magazine covers is not. While publishers remain convinced that white women won’t buy a magazine with a black woman on the cover, it is going to take more than a model with a reputation for having a bit of a temper to change their minds. Someone better tell all those white women who subscribe to O Magazine that Oprah Winfrey’s black and she’s on the cover of every issue.